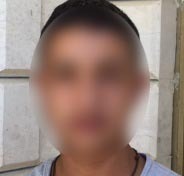 On 25 May 2016, a 14-year-old boy from Beit Fajjar is arrested by Israeli soldiers at 3:15 a.m. One week earlier the soldiers delivered a summons at 2:00 a.m. which was complied with. On 18 May 2016, Israeli soldiers came to our house at around 2:00 a.m. They banged loudly at the front door. They arrested my brother, who is 21 years old, and told my parents to accompany me to the police station the following day. They gave my parents a document in Hebrew with details about where I should go and the time. My brother who reads Hebrew read it. The following morning I went with my father to the Israeli police station in Etzion settlement as requested. My father and I waited from around 8:00 a.m. until around 5:00 p.m. but we were never questioned or even let in. They kept telling us to wait. In the end they took my father’s number and told us they would call later and they sent us home. On 25 May 2016, at around 3:15 a.m., soldiers banged at our front door. They kicked the door with their boots and made a lot of noise. We were all asleep at the time. Two soldiers stood at the door and about 30 more surrounded our house. They asked for my identity card number and compared it to a number they had and then told me they were going to arrest me. I said goodbye to my family and went out with the soldiers. Outside the house I was tied to the front with three plastic ties. The ties were painful. They also blindfolded me and took me to the back of a jeep where I sat on a seat. Soldiers inside the jeep slapped and kicked me and swore at me. The jeep drove to a nearby settlement where I was put in a shipping container. At around 7:00 a.m. I was taken to Etzion police station where I was strip searched and immediately taken for interrogation. The interrogator wore civilian clothes. He asked me for my name and immediately accused of starting a fire at the entrance to the settlement. He did not present me with any evidence to support his allegations and I denied the accusation. When I asked for evidence he told me he knew I did it. I told him I worked at a local quarry and was focused on my work. The interrogator did not inform me of my rights and was quite aggressive and banged the table repeatedly. He wanted to scare me. He tried to extract confessions from me about other boys but I did not say anything. He then accused me of throwing stones at soldiers and showed me a photograph. In the beginning I denied the accusation but later I confessed. The photograph was tagged with my name next to it. I then confessed to throwing one stone from a long distance without hitting anything. The interrogator was typing on his computer and then printed out a document in Hebrew and asked me to sign it. I signed the document after the interrogator told me it was what I had told him. I later found out that it wasn’t what I had told him and that it contained additional confessions about burning tires and hitting a soldier. I read this in the charge sheet which was given to me in the military court. The interrogation lasted for about one-and-a-half hours. I was then photographed and my finger prints were taken and then I was taken to a room where I remained for about four hours. I wasn’t given any food or drink even though I asked. Then I was handcuffed and taken to Ofer prison where I arrived at around 10:00 p.m. I was taken to Section 13. I was not searched at Ofer. I was very hungry by the time I arrived and the other prisoners gave me some food. The following day I was taken to Ofer military court. My parents were not in court because they were not notified but a lawyer was there and the hearing was adjourned. I had about six military court hearings, one of them was an appeals hearing when my lawyer objected to the high bail of 15,000 shekels. In the end the military court decided to release me on bail of 1,500 shekels. I was released on bail on 27 June 2016. My parents drove to pick me up and on the way they had a serious car accident and my father ended up with a fractured back. My mother was injured in the face. They were taken to hospital and my uncle came to pick me up and take me home. In prison I studied Arabic and mathematics and I played volley ball. I have a hearing on 10 July and another on 27 July 2016.